“A Length of Rope” by Ariel Schmidke explores the significant choices we come to in life, with a rope and trapeze suspended on opposing sides of each intersection. These two circus apparatuses represent the struggle of choosing between different directions—be it a choice of place, identity, friendship, or love. The show’s relatability and vulnerability invite spectators to project their own choices on the performance and explore for themselves their lost possibilities. Event space is limited. Please reserve your tickets here. Joining Schmidtke on tour will be Bellingham based performer Strangely. Strangely has thrice circled the globe with his award winning, “rollicking, sing-along, one-man, cabaret riot” (Broadway Baby, Edinburgh) show Roaring Accordion. Never failing to impress, Strangely draws audiences into an epic world where anything can– and often does– happen. Alongside these performers, you’ll see local Madison talent Jess Bruch-Clark, Luv Joy Seamon, and Sarah Muehlbauer performing works-in-progress for a show called “Things That Survived The Winter”—a developing interdisciplinary theatre installation exploring resilience in a dynamic and changeful environment. 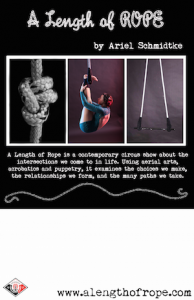 The show conveys the intangible elements that sustain us through the process of transition through the union of circus arts, original soundtrack, and an immersive visual arts setting. Ariel Schmidtke is an interdisciplinary physical performer and multimedia artist. Encouraged at a young age by gymnastics she began training as an aerialist with the Dream Science Circus at the age of eighteen. Ariel spent several years studying dance, theatre, and circus arts in order to diversify her performances. In 2010 she joined the New Old Time Chautauqua Tour, and was inspired by their mission to bring entertainment and education to diverse rural communities with the intention of inspiring creativity and supporting community. After this tour she traveled to Paris, France to explore the origins of Nouveau Cirque and expand her performance skills. In France, she trained intensively at the Académie Fratellini and enriched her approach to circus dramaturgy. She returned to the United States in 2012, and continues to travel and perform her work, hoping to share wonder and excitement with small communities across the country. Joining Schmidtke on tour will be Bellingham based performers Strangely. From emceeing to performing his own full-length show, Strangely will be joining the tour as a multifaceted performer. Strangely has thrice circled the globe with his award winning, “rollicking, sing-along, one-man, cabaret riot” (Broadway Baby, Edinburgh) show Roaring Accordion. Never failing to impress, Strangely draws audiences into an epic world where anything can– and often does– happen. Split-city performer Sarah Muehlbauer (Madison, Philadelphia) will be presenting pieces from full length work-in-development “Things that Survived the Winter”, joined by beloved local artists Jess Clark and Luv Joy Seamon of Cycropia. Sarah produces independently as “Lion or Fox” reaching audiences through the use of spectacle, while focusing primarily on social issues including landscape, sustainability, health, and the re-construction of community in a de-territorialized environment. “Things That Survived The Winter” is in development to be showcased at Crane Arts “Ice Box” gallery space in Philadelphia, and is a fiscally sponsored project under Fractured Atlas.